Five of the cyclin-dependent kinases (CDKs: 7, 8, 9, 12, and 13) are involved in the phosphorylation of serine residues in the C-terminal domain of RNA polymerase II, the enzyme that is responsible for the transcription of protein-coding genes into mRNA in eukaryotes. Phosphorylation of RNA polymerase II at Ser5 is essential for transcriptional initiation, and phosphorylation of Ser 2 contributes to transcriptional elongation and termination. All five of the C-terminal domain kinases can phosphorylate Ser5, but only CDK9, CDK12, and CDK13 can phosphorylate at Ser2 [1,3-4]. The development of CDK inhibitors as anticancer drugs is reviewed in , with detailed content covering CDK4 and CDK6 inhibitors that are under clinical evaluation. Data produced by Jorda et al. (2018) highlights the caution that must be used when deploying commercially available CDK inhibitors as pharmacological probes , as most of them are more promiscuous in their selectivity than indicated. 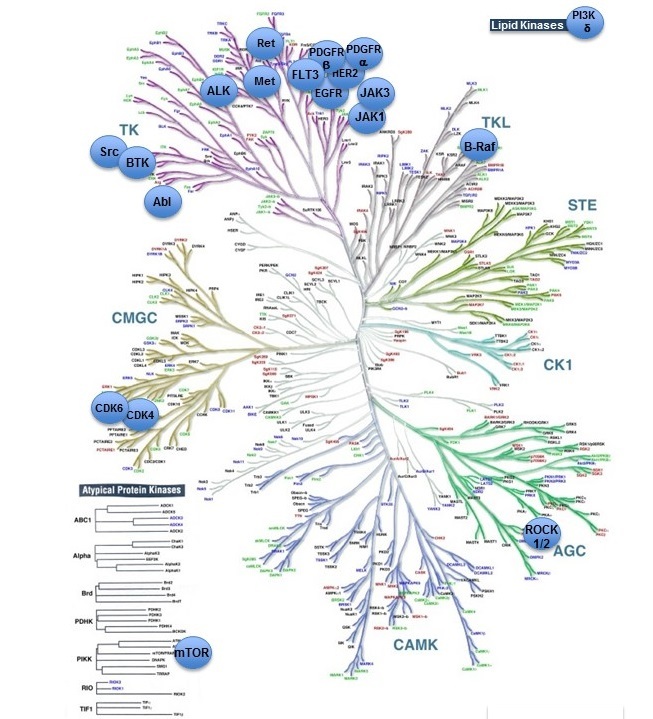 To make their findings easily accessible the Jorda data is hosted on the cyclin-dependent kinase inhibitor database (CDKiDB). Cyclin-dependent kinase (CDK) family. Accessed on 18/04/2019. IUPHAR/BPS Guide to PHARMACOLOGY, http://www.guidetopharmacology.org/GRAC/FamilyDisplayForward?familyId=453.